Water damage refers to the destructive and degenerative effects that water can have on property when there is unwanted water contact during floods or heavy downpours. Even though water is necessary to us it can also cause damage and losses that are just as significant as fires and earthquakes. For water damage restoration services, locate a Restoration Renegades contractor in your zip code, right from the form at the top of this page. During a flood, water can destroy permanent parts of your home with tremendous and destructive force. It can also render appliances, electronics and furniture unusable. What most people aren’t aware of is that water and moisture continue to damage your property long after a flood has subsided. Even though you can’t see water, that doesn’t mean it's not there. Moisture will suspend in the air for long periods of time and water can seep into walls, ceilings and floors where it’s concealed from view continuing to do harm to property. Hidden moisture and water like this causes additional long term damage and creates health risks in the process. Indoor flooding is the most common cause of water damage to any structure. Flooding usually happens suddenly or while you are aways and is hard to stop. 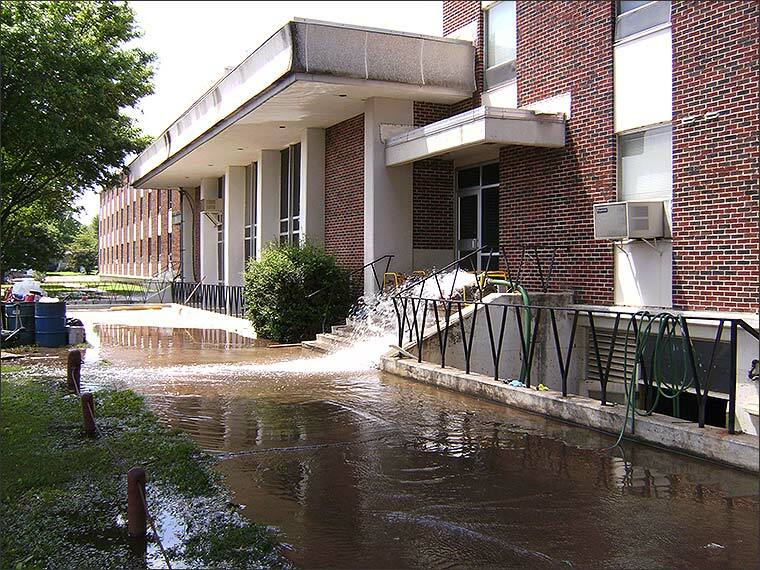 Below is a list of the most common causes of flooding within your living and working spaces. Natural disasters – Storms and overflowing bodies of water can flood entire neighborhoods and there’s usually nothing we can do about it. This water can rush in uncontrollably, damaging property and threatening the lives of family and pets in the process. Pipe leaks – Pipes can leak due to old, corroded or damaged parts. These conditions lead to ruptured plumbing often when there is fluctuating and excessive water pressure. Commonly the bathroom, kitchen or basement is first to flood then large portions of surrounding areas of the house. Sewage overflows – Sometimes septic tanks and sewers leak or backup and overflow. When this happens blackwater can get into your structure and create an unsanitary health hazard and is a serious risk to your property. Toilet overflows – Clogged or malfunctioning toilets have a tendency to overflow. In some cases the overflow may be undiscovered for a long period of time allowing large portions of your home or office to flood. The water (sometimes blackwater) from this kind of flooding is unsanitary and a health hazard and is a threat to your property. Water Heater overflows – Your home or building’s water heater can be a source of flooding as well. A malfunctioning thermostat can cause a heater to continuously boil water, turning it into steam and build up massive internal pressure. When this happens, not even a heater’s metal body can sustain it, resulting in a burst. This allows water to escape and flood it's surroundings. Complicating things is the fact that unheated water from the main supply line will rush in indefinitely until the problem is discovered. Air Contamination – A musty indoor smell is one of water damage’s most telling hallmarks. If the water damage was caused by unsanitary water, it can create a much stronger odor that can pose a health risk for people with pre-existing respiratory problems. It can also affect very young children and the elderly. Weakening of Wood – Wooden walls, floors and ceilings can weaken, get brittle, develop discoloration or flake off when they’re water-damaged. Fungi and microbes can also fester on them, damaging them while creating a real health hazard. Corrosion of Metal Parts – Iron parts of your home, furniture and appliances can rust more easily when they’ve been exposed to water for long periods. Once they start corroding, they weaken and eventually break. They can also be a health risk. If people scratch or wound themselves accidentally with rusted metal edges, the possibility of infection is very high. Mold Growth – This common, fuzzy-looking fungus loves damp environments where it can feed on organic matter. A water-damaged building provides exactly that kind of setting, allowing mold spores to activate, grow and, in the worst cases, form colonies. Mold may not look too threatening, but it can create toxins that can cause illnesses ranging from simple irritations to neurological disorders. Malfunctioning Electronics – Electronic devices such as TVs, computers and gadgets can malfunction and short circuit if they’ve been in contact with water. Even after you dry them off, their internals can corrode and break down, causing system failures. Fire and Electric Hazards – If water seeps into walls, floors or ceilings, there’s a good chance that they’ll wet your electrical wires. This can create a myriad of hazards. You can get shocked by touching damp surfaces or wires can short circuit and start fires. Restoration Renegades to the Rescue! The water damage that internal flooding brings is very disruptive to a home or workplace. If you want your property quickly and expertly returned to its pre-flood state, please use our zip code locator form or contact form to quickly connect with a superior, affiliated Restoration Renegades contractor. Restoration Renegades is a network of professional restoration contractors who serve people in need of help all over the country. We’ve got the latest and greatest disaster recovery and restoration tools and knowledge. With our extensive experience in water damage restoration, you can trust us to assess, contain and completely extract the water as quickly as possible. We will then help you to restore your property back to its original state or to even an improved state. While we’re doing all this, Jeremy can drop by and film the project. Our main goal is to give you back what water took away and to cheer you up while we’re at it. A Restoration Renegades contractor is ready to respond to you 24 hours a day, seven days a week, all year long. Find a Restoration Renegades contractor in your zip code now, right from the top of this page. We’re great at helping you out even when you’ve got a big emergency on your hands. A friendly and professional Restoration Renegades contractor will see to it that you get the assistance you need as soon as you need it.